Sleep Walking – How To Get Out Of It? Sleepwalking (Somnambulism) is a series of complex behaviors that are initiated during slow wave sleep and result in walking during sleep. 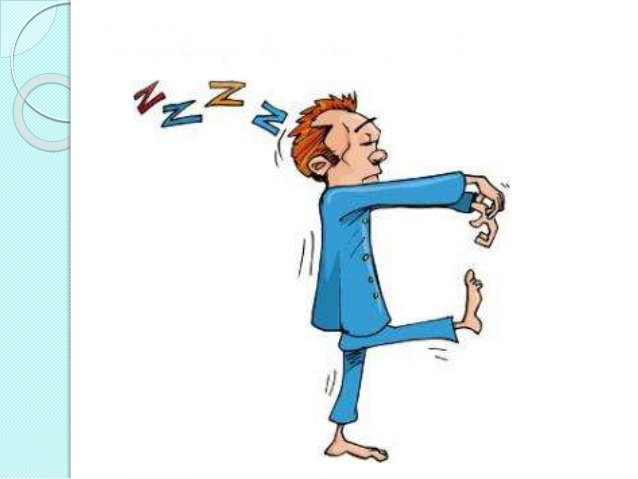 Ambulation (walking or moving about) that occurs during sleep. The onset typically occurs in prepubertal children. Medical reports show that about 18% of the population is prone to sleepwalking. It is more common in children than in adolescents and adults. Boys are more likely to sleepwalk than girls. The highest prevalence of sleepwalking was 16.7% at age 11 to 12 years of age. Sleepwalking can have a genetic tendency. If a child begins to sleepwalk at the age of 9, it often lasts into adulthood. For some, the episodes of sleepwalking occur less than once per month and do not result in harm to the patient or others. Others experience episodes more than once per month, but not nightly, and do not result in harm to the patient or others. In its most severe form, the episodes occur almost nightly or are associated with physical injury. The sleepwalker may feel embarrassment, shame, guilt, anxiety, and confusion when they are told about their sleepwalking behavior. If the sleepwalker exits the house or is having frequent episodes and injuries are occurring — DO NOT delay, it is time to seek professional help from a sleep disorder center in your area. There have been some tragedies with sleepwalkers, don’t let it happen to your loved one! What can be done about sleepwalking? Make sure you get plenty of rest! Being overtired can trigger a sleepwalking episode. Stress can be another trigger for sleepwalking. Develop a calming bedtime ritual. Some people meditate or do relaxation exercises. Remove anything from the bedroom that could be hazardous or harmful. The sleepwalker’s bedroom should be on the ground floor of the house. The possibility of the patient opening windows or doors should be eliminated. An assessment of the sleepwalker should include a careful review of the current medication so that modifications can be made if necessary. Hypnosis has been found to be helpful for both children and adults. An accurate psychiatric evaluation could help to decide the need for psychiatric intervention. Purchasing Benzodiazepines have been proven to be useful in the treatment of this disorder. Buying Ambien and consuming a small dose of the drug can eliminate the episodes or considerably reduces them. Why Is Ambien Preferred In Sleep Disorders Treatment? How Can You Use Ambien For Various Sleep Disorders? Which is the best Ambien dosage for proper sleep? Why should you use generic ambien over the brand as a sleep aid? How Effective Is Valium For Insomnia? How to Use Kratom for prolonged sleep? How effective is Kratom for treating Insomnia?